One of the most fascinating trends in contemporary art over the past decade has been its increasing interest in science fiction. Either as a pop cultural reference point or the conceptual link between the speculative practices of contemporary art and science fiction, this trend has seen dozens, if not hundreds, of international and Australian artists creating sci-fi-inflected pieces, with exhibitions around the world surveying their work. The connection between the two genres makes sense. Sci-fi and contemporary art share a history: they were both born in the 19th century; both express and explore concerns about the nature of human experience; and both are enthralled by technology and the possibilities of the future. That they are considered to be separate is really just a question of definition and, given that so many artists have found these connections rich with possibility, it feels as though the time for a hybrid sci-fi art has arrived. I’ve taken a keen personal interest in this development, as it combines two of the things I love best in culture, and I’ve made my own modest contributions to the trend, curating an exhibition and making a documentary on the subject. So you can imagine my excitement when the 2016 Biennale of Sydney revealed its title to be The Future Is Already Here – It’s Just Not Evenly Distributed, a typically wry, aphoristic comment by the American-Canadian science fiction author William Gibson. All signs pointed to interesting possibilities for Sydney’s 20th Biennale, curated as it was by Stephanie Rosenthal, the chief curator at London’s Hayward Gallery – the site of the 2008 exhibition, Psycho Buildings, which was one of the key recent shows featuring sci-fi-related art. BOS20 sprawls over six main venues, and a constellation of temporary and roving sites around Chippendale. Each main venue is conceived as an “embassy” – a kind of neutral zone of related thematic ideas. Cockatoo Island, for example, is the Embassy of the Real, where reality, the body, physical space, choreography, fictional reality, sci-fi, folded space, outer space, communication, language, the world wide web and capitalism are the connecting threads through 21 individual works. The Museum of Contemporary Art is the Embassy of Translation, the Art Gallery of New South Wales is the Embassy of Spirits, and so on, each with another dozen or so connecting ideas. If BOS20 is sounding already overloaded – and maybe overthought – the experience at the venues is more diffuse than this cluster of words and concepts might suggest. 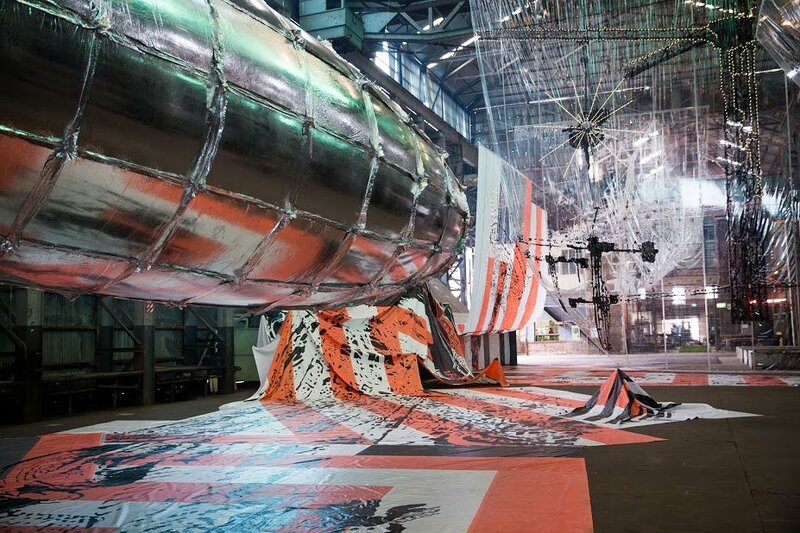 On Cockatoo Island, for instance, the South Korean artist Lee Bul – an artist with a longstanding connection to sci-fi through robots, cyborgs and anime-influenced sculptures – presents Willing To Be Vulnerable (2016), a gigantic installation in the Turbine Hall of draped and painted plastic sheets, an airship, a balloon, track lighting and ominous black figures that look like impaled and beheaded corpses. The work is highly atmospheric, a perfect fit for the venue, and a playful if dark suggestion of a steampunk circus with the air let out. Some artists’ work connects more or less directly to the BOS20 theme: Min Wong’s multichannel video work explores Chinese science fiction and space exploration, and Xu Zhen’s jumble of classical statuary looks like the recovered remnants of a destroyed museum. William Forsythe’s Nowhere and Everywhere at the Same Time (2015) – a room full of swinging plum bulb pendulums – is more ambiguous but breathtaking nonetheless. With some stunning large-scale video works, such as Korakrit Arunanondchai’s Painting with History … (2015), in the main building and exquisite drawings of imaginary maps by Emma McNally tucked away on the top of the island, I walked back to the ferry on a high: this was starting to feel like the best biennale in years. The MCA works offer a more sedate and tangential relationship to the theme. Its few delights are rich – Celine Condorelli’s Additionals (2016), a gold and silver curtain, is made of the same material as the emergency blankets given to refugees, but even as a floating, ephemeral wall, it’s still an impassable object. Dayanita Singh’s Suitcase Museum (2015) proposes intriguing speculative narratives built from a vast archive of her photographs, presented as book covers and cantilevered lengths of paper in imposing wall-mounted boxes. This mixture of materials and metaphor works very well, and reflects the way in which literary and cinematic science fiction weaves its worlds. Beyond these two works, however, the magic of the idea at the MCA is dissipated by generic contemporary art that’s either flippant or slight, or must be read in a context entirely unapparent just by looking at it. Things are significantly improved at the Art Gallery of NSW, aka the Embassy of Spirits, where a strong selection of individual pieces works brilliantly together: Yin-Ju Chen’s combination of drawings of scarred geometry with wall projections of Mars and Pluto, Rodel Tapaya’s massive metaphorical painting, Taro Shinoda’s painting peeling room, Nyapanyapa Yunupingu’s ghostly poles and Ken Thaiday Sr and Jason Christopher’s motorised shark sculpture all resonate with works by other artists, their simple means of construction and making often contrasting with the familiar technological forms of contemporary art. While the connection of these works with sci-fi might seem obtuse, the mythologies of modern technological societies are often based on ancient beliefs and are no less persuasive because of it. The combination of new and old seems, oddly enough, futuristic. The Embassy of Non-Participation at Artspace is by turns fascinating and disturbing. The artists Karen Mizra and Brad Butler present a gallery-wide installation of works that examine resistance to neoliberalism, from the provocative You Are the Prime Minister – in which you, as British PM, are asked to draft a speech justifying police firing on protesters in a future London wracked by civil unrest – to a video of actual footage of the 2008 Mumbai terrorist attacks, to more videos and pamphlets and wall works. The sense of the here and now in the Artspace show is strong – and without any of the escape provided by utopian sci-fi. The final major BOS venue is Carriageworks, the Embassy of Disappearance, and, it must be said, it’s disappointing. The exhibition of the works feels arbitrary, with little sense of narrative or connections between them except that they’re all lined up, one after the other, in rows. There are, however, some excellent works here. In the immersive Don’t Follow the Wind (2015-ongoing), the viewer dons a headset to view an exhibition that’s staged within the Fukushima disaster exclusion zone. It’s a multi-artist international project that can only be viewed at a distance via virtual reality – or until the day the exclusion zone is lifted. Gerald Machona’s space suits made from decommissioned African currencies stand like weird sentinels in the darkness, while Jamie North’s majestic sculptures of concrete and living plants are future memorials for this world. So is the future already here? Is it just unevenly distributed? Gibson’s famous aphorism suggests that what we think of as the future is really the slowly spreading waves of change – new technologies, new social relationships, new forms of real and virtual life – all eventually becoming familiar parts of everyday reality. BOS20 captures that idea, arranging works that reflect those spreading waves that, when taken as a whole, represents a science fictional present. That the biennale is at times frustrating, dystopic, obtuse and ugly – instead of always utopian, beautiful, accessible and optimistic – proves that it is once more a reflection of the here and now.